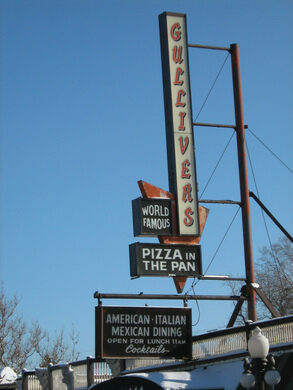 Help improve Atlas Obscura by expanding Gullivers Pizza with additional information or photos. You will never get bored at this Chicagoland Pizzaria. With three locations, the 2727 Howard Street location is the place to go. The place is packed with gorgeous, museum quality pieces. There is also Victorian and Art Nouveau statues, bric a brac, and other random art everywhere. The food, the solid pub and bar grub, is great, but they also have really good pizza, both thin and stuffed as well as their signature pan. tips ? Just go for great Pan Pizza. Everything fine. Quality cheese non of that greasey cheap cheeses. . Everything fresh and try their salads.